Diffuse axonal injury (DAI) is a frequent result of traumatic acceleration/deceleration or rotational injuries and a frequent cause of persistent vegetative state in patients. In fact, DAI represents approximately one half of all intra-axial traumatic lesions. This lesion is the most significant cause of morbidity in patients with traumatic brain injuries, which most commonly result from high-speed motor vehicle accidents. Any patient with a closed head injury who experiences extensive loss of consciousness and neurological deficits warrants neuroimaging. Diffuse axonal injury typically consists of several focal white-matter lesions measuring 1-15 mm in a characteristic distribution. See the images below. 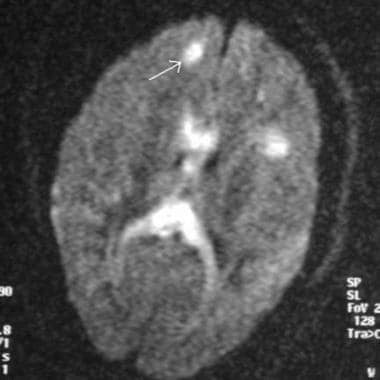 Noncontrast computed tomography scan of a trauma patient demonstrates multiple petechial hemorrhages (arrows) consistent with diffuse axonal injury. Note that the hemorrhages are characteristically located at the gray-white matter interface. Classically, DAI has been considered a primary-type injury, with damage occurring at the time of the accident. Research has shown that another component of the injury comprises the secondary factors (or delayed component), since the axons are injured, secondary swelling occurs, and retraction bulbs form. Of patients with DAI, 80% demonstrate multiple areas of injury on computed tomography (CT) scans. The degree of microscopic injury usually is considered to be greater than that seen on diagnostic imaging, and the clinical findings reflect this point. DAI is suggested in any patient who demonstrates clinical symptoms disproportionate to his or her CT-scan findings. DAI results in instantaneous loss of consciousness, and most patients (>90%) remain in a persistent vegetative state, since brainstem function typically remains unaffected. DAI rarely causes death. Magnetic resonance imaging (MRI) is the preferred examination for DAI (particularly with gradient-echo sequences), although CT scanning may demonstrate findings suggestive of DAI and is more practical and available. [2, 4, 5, 6, 7, 8, 9, 3, 10] Studies have indicated that MRI can play a role in predicting the length of coma in DAI patients. However, MRI is contraindicated in patients with implanted pacemakers or certain types of metallic prostheses, as well as in patients who have metallic foreign bodies, such as bullet fragments, in their head or neck or near important vascular structures. In addition, MRI is difficult to perform on patients who have claustrophobia and on ventilator-dependent patients. No specific findings related to diffuse axonal injury can be made using conventional radiography, the degree of confidence is low, as conventional radiography cannot demonstrate subtle soft-tissue changes; however, other signs of head trauma can be appreciated, such as facial bone fractures or fluid levels within the paranasal sinuses. Radiographs can also clearly demonstrate skull fractures, but this is not helpful in DAI, as DAI is rarely associated with skull fracture. Thus, many false negatives are possible, because a negative skull radiograph in no way excludes a parenchymal brain injury. 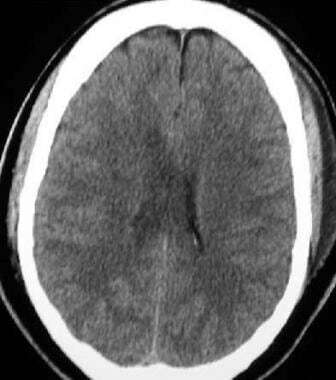 Wang and colleagues  suggested CT scan criteria using the presence of one or more small intraparenchymal hemorrhages less than 2 cm in diameter located in the cerebral hemispheres, intraventricular hemorrhage, hemorrhage in the corpus callosum, small focal areas of hemorrhage less than 2 cm in diameter adjacent to the third ventricle, and brainstem hemorrhage as characteristic of DAIs. There may also be small focal areas of low density on CT scans; these correspond to areas of edema occurring where shearing injury took place. The degree of confidence in CT scanning is moderate, as the only finding may be petechial hemorrhage, and fewer than 20% of patients with DAI demonstrate this finding on CT scanning alone. When petechial hemorrhages are observed with the appropriate clinical findings, the sensitivity of CT scanning in the detection of DAI is high. Noncontrast axial computed tomography (CT) scan demonstrates why magnetic resonance imaging (MRI) is the study of choice in diagnosing diffuse axonal injury. This CT scan appears normal, although on closer examination, punctate hypodensities can be observed in the right frontal and left parietal white matter. T1-weighted images are helpful for anatomic localization  ; however, nonhemorrhagic lesions may be isointense to surrounding tissue. Hemorrhagic lesions appear hyperintense on T1-weighted images. However, on T2-weighted sequences, nonhemorrhagic lesions appear hyperintense. Diffusion-weighted sequences can reveal hyperintensities in areas of axonal injury. As demonstrated in the image below, gradient-echo sequences are particularly useful in revealing the paramagnetic effects of petechial hemorrhages. Gradient-echo imaging can often show signal abnormality in areas that appear normal in T1- and T2-weighted spin-echo sequences. For this reason, gradient-echo imaging has become a mainstay of MRI exams for patients with suggested shearing-type injuries. The abnormal signal on gradient-echo images can persist for many years after the injury. The most common MRI finding of DAI, as seen in the image below, is the presence of multifocal areas of abnormal signal (bright on T2-weighted images) at the white matter in the temporal or parietal corticomedullary junction or in the splenium of the corpus callosum. Other areas that frequently are abnormal include the dorsolateral rostral midbrain and the corona radiata. Eventually, nonspecific atrophic changes are observed. Diffusion-weighted imaging (DWI) and the corresponding apparent diffusion coefficient (ADC) differentiate between lesions with increased and decreased diffusion based on the net movement of water molecules. Traditionally, DWI has been used for the diagnosis of acute stroke, given its high sensitivity for acute ischemia; however, DWI has been shown to be sensitive for other cerebral disease processes, including DAI. Characteristic imaging findings on DWI/ADC can be broken down into 3 types: (1) Lesions that are hyperintense on DWI and ADC, (2) lesions that are hyperintense on DWI and hypointense on ADC, and (3) hemorrhagic lesions that are hypointense on DWI and ADC but are surrounded by a hyperintense signal on DWI and ADC. See the image below. Diffusion-weighted axial image on the left demonstrates multiple foci of increased signal intensity in the right frontal lobe, corresponding to areas that surround hemorrhage. The axial gradient-echo sequence on the right confirms microhemorrhages in the right frontal lobe from diffuse axonal injury (DAI). Studies have reported that the magnetic transfer ratio has shown promise in identifying areas of injury not visible on the above MRI pulse sequences. This may allow the radiologist to appreciate a truer representation of the degree of microscopic injury. Studies have also indicated that MRI can play a role in predicting the length of coma in DAI patients. The volume of white-matter lesions has been correlated to the degree of injury, as measured by MRI. MRI has also been used to quantify cerebral blood flow in damaged areas of the brain, thus predicting injury severity. 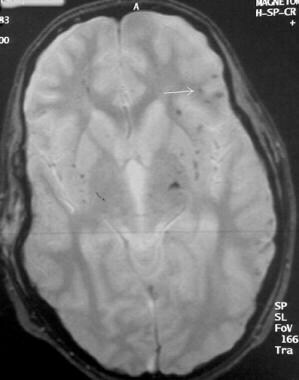 Multiple sclerosis (MS) is a progressive neurologic disorder that can involve multiple foci of white-matter signal abnormality on MRI; however, MS lesions typically are oval or oblong and are oriented in a direction perpendicular to the border of the lateral ventricles (Dawson fingers). In addition, MS lesions may involve the spinal cord, a finding not associated with DAI, and the clinical course of MS is dramatically different from that of DAI. False negatives may occur with MRI if only routine sequences are performed. A sequence (such as gradient echo) that accentuates the susceptibility artifact arising from blood products must be performed in order to recognize small petechial hemorrhages. Nuclear medicine currently has no role in the routine diagnostic workup of patients with possible diffuse axonal injury; however, studies have suggested that iodine-123 (123I) single-photon emission CT (SPECT) imaging demonstrates areas of hypoperfusion in areas of known injury and reveals additional areas of injury not visualized with MRI. Thomas M, Dufour L. Challenges of diffuse axonal injury diagnosis. Rehabil Nurs. 2009 Sep-Oct. 34(5):179-80. [Medline]. Kinoshita T, Moritani T, Hiwatashi A, et al. 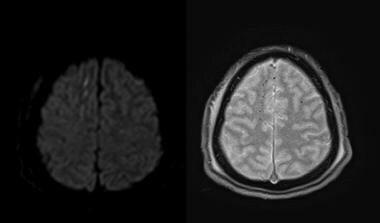 Conspicuity of diffuse axonal injury lesions on diffusion-weighted MR imaging. Eur J Radiol. 2005 Oct. 56(1):5-11. [Medline]. Liu J, Kou Z, Tian Y. Diffuse axonal injury after traumatic cerebral microbleeds: an evaluation of imaging techniques. Neural Regen Res. 2014 Jun 15. 9 (12):1222-30. [Medline]. Schrader H, Mickeviciene D, Gleizniene R, et al. Magnetic resonance imaging after most common form of concussion. BMC Med Imaging. 2009 Jun 17. 9:11. [Medline]. [Full Text]. Skandsen T, Kvistad KA, Solheim O, et al. Prevalence and impact of diffuse axonal injury in patients with moderate and severe head injury: a cohort study of early magnetic resonance imaging findings and 1-year outcome. J Neurosurg. 2009 Oct 23. [Medline]. Ljungqvist J, Nilsson D, Ljungberg M, Sörbo A, Esbjörnsson E, Eriksson-Ritzén C, et al. Longitudinal study of the diffusion tensor imaging properties of the corpus callosum in acute and chronic diffuse axonal injury. Brain Inj. 2011. 25(4):370-8. [Medline]. de la Plata CM, Ardelean A, Koovakkattu D, et al. Magnetic resonance imaging of diffuse axonal injury: quantitative assessment of white matter lesion volume. J Neurotrauma. Apr 2007. 24(4):591-8. [Medline]. Zheng WB, Liu GR, Li LP, et al. Prediction of recovery from a post-traumatic coma state by diffusion-weighted imaging (DWI) in patients with diffuse axonal injury. Neuroradiology. 2007 Mar. 49(3):271-9. [Medline]. Moenninghoff C, Kraff O, Maderwald S, Umutlu L, Theysohn JM, Ringelstein A, et al. Diffuse axonal injury at ultra-high field MRI. PLoS One. 2015. 10 (3):e0122329. [Medline]. Toth A, Kovacs N, Tamas V, Kornyei B, Nagy M, Horvath A, et al. Microbleeds may expand acutely after traumatic brain injury. Neurosci Lett. 2016 Mar 23. 617:207-12. [Medline]. Mata-Mbemba D, Mugikura S, Nakagawa A, Murata T, Kato Y, Tatewaki Y, et al. 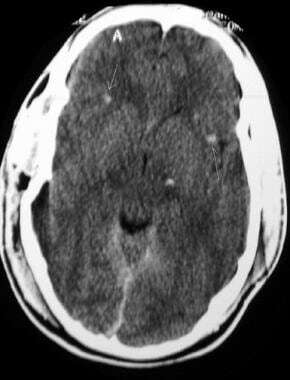 Intraventricular hemorrhage on initial computed tomography as marker of diffuse axonal injury after traumatic brain injury. J Neurotrauma. 2015 Mar 1. 32 (5):359-65. [Medline]. Wang H, Duan G, Zhang J, et al. Clinical studies on diffuse axonal injury in patients with severe closed head injury. Chin Med J (Engl). 1998 Jan. 111(1):59-62. [Medline]. Teasdale GM. Head injury. J Neurol Neurosurg Psychiatry. 1995 May. 58(5):526-39. [Medline]. Uruma G, Hashimoto K, Abo M. Evaluation of Regional White Matter Volume Reduction after Diffuse Axonal Injury using Voxel-based Morphometry. Magn Reson Med Sci. 2015. 14 (3):183-92. [Medline]. Gentry LR, Godersky JC, Thompson B. MR imaging of head trauma: review of the distribution and radiopathologic features of traumatic lesions. AJR Am J Roentgenol. 1988 Mar. 150(3):663-72. [Medline]. Schaefer PW, Grant PE, Gonzalez RG. Diffusion-weighted MR imaging of the brain. Radiology. 2000 Nov. 217(2):331-45. [Medline]. Hergan K, Schaefer PW, Sorensen AG, Gonzalez RG, Huisman TA. Diffusion-weighted MRI in diffuse axonal injury of the brain. Eur Radiol. 2002 Oct. 12(10):2536-41. [Medline]. Sugiyama K, Kondo T, Oouchida Y, et al. Clinical utility of diffusion tensor imaging for evaluating patients with diffuse axonal injury and cognitive disorders in the chronic stage. J Neurotrauma. 2009 Nov. 26(11):1879-90. [Medline]. Gean AD. Imaging of Head Trauma. New York, NY: Raven Press; 1994. Atlas SW, ed. Magnetic Resonance Imaging of the Brain and Spine. 2nd ed. New York, NY: Raven Press; 1996. Osborn AG. Diagnostic Neuroradiology. St Louis, Mo: Mosby-Year Book; 1994. 212-5. Gentry LR, Godersky JC, Thompson B, et al. Prospective comparative study of intermediate-field MR and CT in the evaluation of closed head trauma. AJR Am J Roentgenol. 1988 Mar. 150(3):673-82. [Medline]. Ito H, Ishii K, Onuma T, et al. Cerebral perfusion changes in traumatic diffuse brain injury; IMP SPECT studies. Ann Nucl Med. 1997 May. 11(2):167-72. [Medline]. McGowan JC, McCormack TM, Grossman RI, et al. Diffuse axonal pathology detected with magnetization transfer imaging following brain injury in the pig. Magn Reson Med. 1999 Apr. 41(4):727-33. [Medline]. Wilson JT, Hadley DM, Wiedmann KD, et al. Neuropsychological consequences of two patterns of brain damage shown by MRI in survivors of severe head injury. J Neurol Neurosurg Psychiatry. 1995 Sep. 59(3):328-31. [Medline]. Fluid-attenuated inversion recovery sequence demonstrating edema within the corpus callosum (arrow) secondary to traumatic shearing injury. Note that other areas of edema are observed in this patient with diffuse axonal injury.